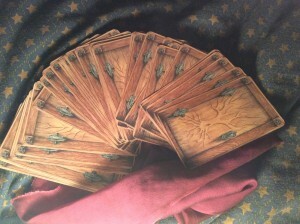 This deck is the well worn path cards. It is a dearly dearly dearly well loved deck of mine. 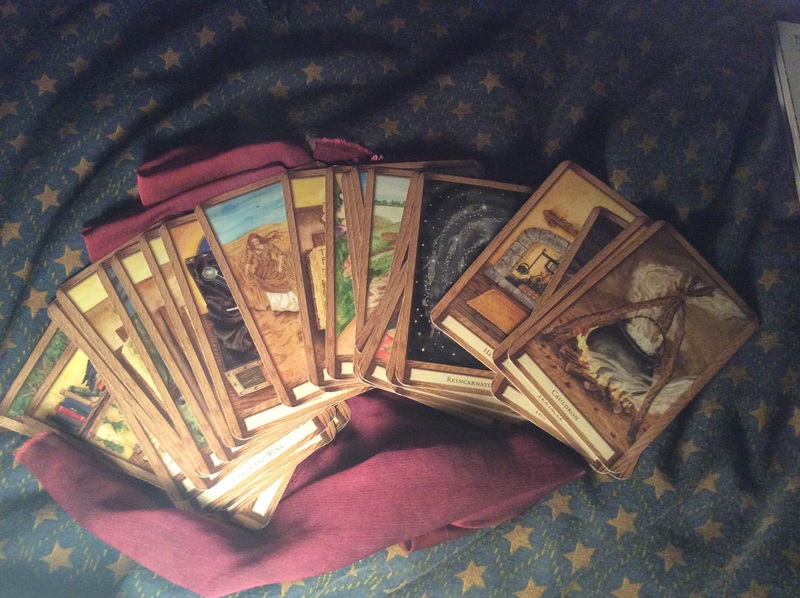 I call them my witch path cards with affection. The energy aligned with this deck is the Goddess/Lady Hecate. When a client is at a crossroads and/or facing a big decision on their path among other possible factors, this deck is the to-go deck for that type of work with what I’ve noticed in regards to specific sessions I’ve facilitated with clients. The cauldron card felt like the appropriate card for today. why? Well, the Cosmic sky energy currently is with the Aquarius moon transiting into Pisces moon tonight. Aquarius addresses the collective consciousness energy while Pisces is One and All, pretty much the Alpha and Omega, the beginning and the end at the same time. With my long time studies of astrology, one of many insights I have with Pisces moon energy is that it is a swirling energy of beginnings and endings, old cycles dying and new cycles birthing within each other. The number 9 resonates with that particular energy – old cycles dying and new cycles birthing within each other. Cauldrons are found in many many many cultures and folklore/mythos/stories. The Goddesses/Ladies Cerwidden (Welsh) and Brigid (Celtic/Irish) have the cauldron as one of their many symbols. One of the Celtic gods, the Dagda also has a cauldron. Bran the Blessed, from the Welsh tradition, has a cauldron symbol too. 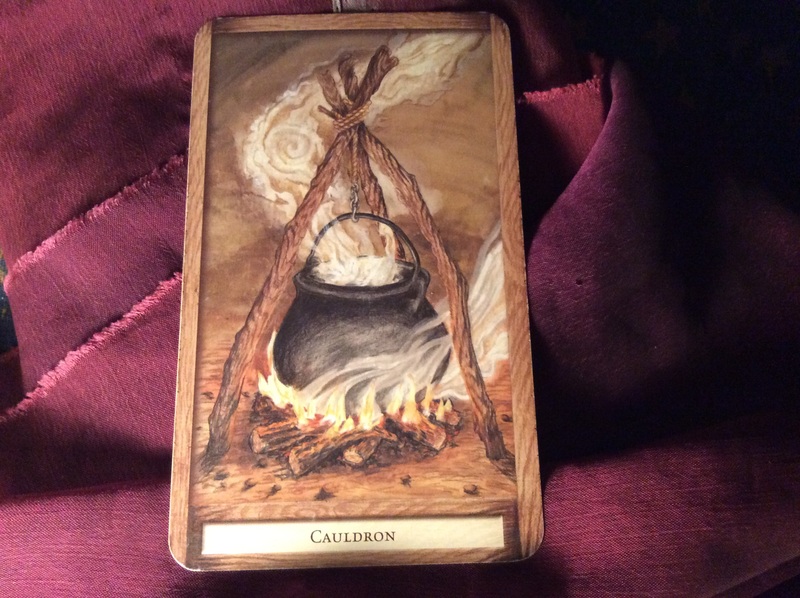 There are many, many, many interwoven threads with the cauldron and what it can and does hold as an archetype, a symbol, and a powerful witch tool….. Creating, brewing, concocting, cooking, and divination are just several of the multifaceted uses of this tool. 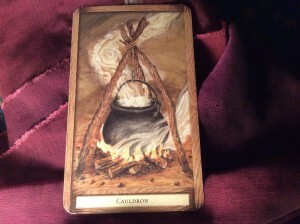 Personally, I connect deeply myself with the cauldron since my natal moon is in Cancer… Hearth connection is a huge part of the Cancer moon energy for me. Cerwidden and Brigid are two of the several deities I relate with in some powerful ways with the cauldron. I will touch more upon the Hearth space in the next post! ← Samhain, Scorpio solar returns, Ancestors’ Day…. These are the well worn path cards ~ about 40 cards in this deck. You can get them at Amazon online and/or metaphysical/alternative spirituality oriented shops. Blessings!